In January 2015, a new Ichthyosaur was discovered in the Isle of Skye, large island in the Inner Hebrides of Scotland. Scientists believe it to be a dolphin like creature that grew up to 14 feet in length. This ancient sea creature was named Dearcmhara Shawcrossi. Dearcmhara, pronounced ‘jark vara’ – is Scottish Gaelic for marine lizard. Shawcrossi pays tribute to Brian Shawcross, the enthusiast that recovered the fossils from Bearring Bay on the Isle of Skye. Taking my knowledge of meats and mythical creatures. I’ve imagined what this beast would taste like and how to prepare it. Line a baking sheet with tin foil. Then place a sheet of plastic wrap on top of the foil. Spread a 1/3rd of the cure onto the plastic wrap that is long as your filet. Place the fillet over the cure, skin side down. Spread another 1/3rd of the cure over the fillet. Place the second fillet, skin side down, on top of the other fillet. Spread the last 1/3rd of the cure over the second fillet. Using a second sheet of plastic wrap and tin foil, tightly wrap the Dearchmara in both. Place another baking sheet over the top and then weigh it down with something heavy like cookbooks or heavy pots. Place into your fridge for about 9 hours or so. A thinner fillet can go a little less and something thicker can go a little more. Remove the Dearcmhara from your fridge and remove the wrapping. Rinse off the fish under cold water, removing all of the cure. Make sure the fillets are dry by gently with paper towels. Pat each of the fillets with the rub making sure to cover entirely. Leave one small corner of the fillet from being rubbed. Give the fillets up to 3 hours to dry. You will notice a matte-like film start to form on the fish in the area that you did not rub. This is called a pellicle. When you see this, the fish is ready to be smoked. Get your smoked to about 150-160°F. Choose a hardwood like Apple, Cherry, Oak or Hickory for your smoker. These flavors will bring out the best in the flavors of your cure and the rub. Place the Dearcmhara Shawcrossi in the smoker, skin side down. Smoking times will vary based on the thickness of the fillets. Using a meat thermometer, test the thickest part and when it reaches 140°F, you are done. Smoke for up to 3 hours, depending on thickness of the fillets. Remove and place on a baking sheet. Using tin foil, tent the fillets and allow it to sit for 20-30 minutes. This is important for the texture and flavors of the meat. Little known fact about Unicorn meat, you can cook it with as many peppers and heat agents as you want but eventually the magic powers of the Unicorn will counteract the heat. If you want your Unicorn dishes spicy, you have to eat them immediately after you cook them. I would advise using hot sauce rather than cooking it into the dish. Sauté onions and garlic in olive oil until slightly brown. Add Unicorn chuck & cook until fully browned, stirring often. Add rest of ingredients with the spices last. Once all ingredients are in the pot, bring to a fast boil. Reduce to simmer, stirring occasionally. Simmer for at least 2 hours. Nothing says I love you like slaying a Dragon for your Damsel. Nothing says “take that Dragon” like grilling it’s heart. You’re going to need a very sharp knife for this one. Cut Dragon Hearts into small chunks and place in a bowl. Mash the garlic into a separate bowl, adding the olive oil and a little water to help form a paste. In a bowl, add the crushed garlic, red wine vinegar, Gochujang, cumin, salt & pepper. Mix thoroughly. Add Dragon Hearts to marinade & mix well. Allow to sit overnight in the fridge. Place 4 Dragon Heart chunks on each skewer. Grill each skewer about 5 minutes per side, basting with leftover marinade many times while grilling. The flu season has hit in full effect and while you’re at home nursing it you’ll be eating lots of soup. Here’s a great soup recipe that my grandmother used to make us when we were sick. And in case you haven’t heard…Bacon is the new flu shot. Cook Chupacabra bacon until brown on stovetop in a frying pan. Do not overcook or burn. Pour off bacon fat. Melt the butter in a large pot. Add in bacon, onions and spices. Cover & cook on low about 45 minutes, stirring occasionally. Raise heat to medium and stir in the sugar. Stir often while about 12 minutes. Heat the oven to 350 degrees. Butter a baking sheet and place slices of bread on top. Once one side is just turning brown, turn once and repeat. Add bay leaf & Chupacabra broth to pot and bring mixture to a boil using medium heat. Once boiling, reduce heat to low and simmer for about 10 minutes. Then discard bay leaf. Using oven proof bowls or crocks, fill with soup, top with bread slice and then cheese. Brown about 3 minutes. This one is great at a tailgate, backyard BBQ or a big cookout. Combine all ingredients in a bowl and stir to blend thoroughly. Store in an airtight container. Combine seasoning blend and ground Unicorn in a bowl by mixing gently and thoroughly. Divide into 4 even portions and pat each portion into a flattened patty. Preheat grill to medium high. Grill patties about 3 to 4 minutes per side for medium rare. Remove and serve burgers on buns garnished with gouda cheese and any other desired condiments. When it’s cold outside, you’ll want something to warm you up. This one is hot, REALLY hot, but what else would you expect from Dragon Meat?!!? In hot water, soak the ancho chiles for 30 minutes, then drain well. While the anchos are soaking, add olive oil, onions & garlic to a large sauce pot. Saute on high until onions are almost translucent. Add Dragon meat and cook until brown, stirring constantly. Once meat is browned, add the rest of the ingredients into the bot. Stir thoroughly. Once mixed, bring to a boil and stir once more. Lower temperature and simmer for two hours, stirring about every 15 minutes. Here’s a recipe for one of my family’s favorite holiday dishes, Unicorn Pot Roast. Set slow cooker on low setting. Let simmer for 3-5 hours. The Mythical Creature Butcher Shop online merchandise store has launched! 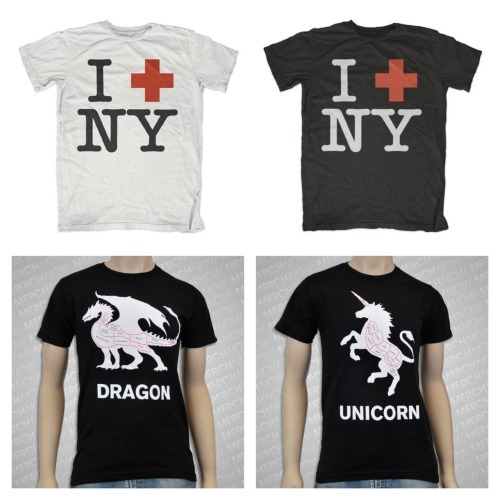 Purchase the “I Save New York,” Dragon Meat or Unicorn Meat shirts and proceeds from the sale will be donated to the NYC Mayor’s Fund to advance New York City. We’ve been working with the NYC Mayor’s Office via The Food Film Festival & the New York City Food Truck Association to feed people hot and fresh free food as a relief to Super Storm Sandy. Read more here. For the first time ever, Marcelo Cain Terrato, owner of the Mythical Creature Butcher Shop brings his strange meats and merchandise to NYC. Join Marcello, That Burger & Idle Hands Bar for a special evening. From That Burger – Lettuce, Tomato, Thousand Island, American Cheese and UNICORN MEAT. From That Burger – sauteed Onions & Jalapenos cooked in Frank’s Hot Sauce & Cheddar Cheese & DRAGON MEAT.